Vodafone Digital Parenting with VodafoneÂ was developedÂ to provide parents with all the information they need about technology and the family. Â With how to guides to help set up parental controls and information on Facebook, as well as a wealth of articles from leading experts, it\'s a one stop shop for any parent looking to take back control of their children\'s digital lives. Or at least understand it a bitÂ more! You can view the latest magazine and all previous editionsÂ online. To view the first issue of the Vodafone Digital Parenting MagazineÂ clickÂ here. To view Vodafone Digital Parenting magazine 2Â click here. Click on the link below for information on how to keep your children safe when using the internet. At Minchinhampton,Â we promote the use of ICT to enhance learning and thinking and teach all of the children how to keep themselves safe.At home, many children use computers to play games and learn.Â We want to encourage you to ensure children are supervised at all times at home, especially when accessing the internet. When your child is using the internet at school or at home it is very important that they stay safe. We teach you child to FLAG IT,Â BLOCK IT & REPORT IT if they see anything on the internet they are concerned about. 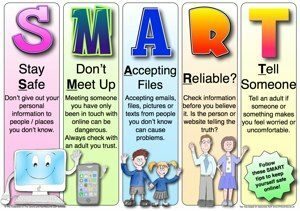 Your child would have been taught at school how to stay safe when using the internet on the computer, an IPad or a mobile phone. It is also a good idea to talk about these safety issues at home with your child.